For most people who visit the site of Ancient Corinth, the Roman forum is the principal (if not only) destination. Many visitors are unaware of the ancient buildings and ancient spaces scattered about the modern village and enclosed in chain-linked fences. Temples, tombs, villas, walls, churches, amphitheater all highlight the urban world buried beneath the village. The Panayia Field is one of these areas recently excavated by teams from the American School of Classical Studies. While it is located only about 200 meters southeast of the forum, it is not immediately visible to visitors and is enclosed behind a fence that makes it inaccessible. 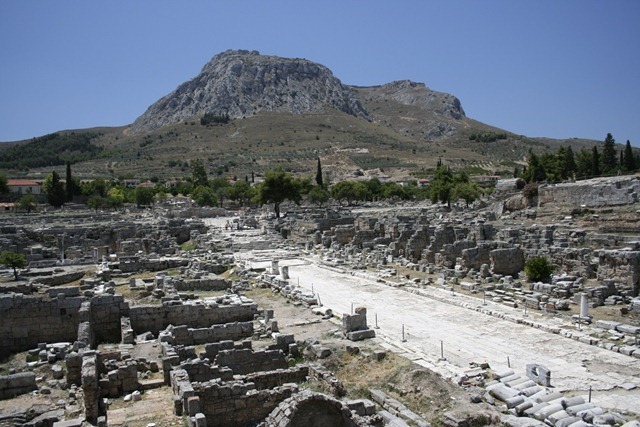 Nonetheless, it is changing our picture of premodern Corinth. More than a decade of excavations at Panayia Field has revealed important remains from the Geometric to the Modern Period, some of which have been published in a series of reports or studied as part of recent dissertations (see list below). 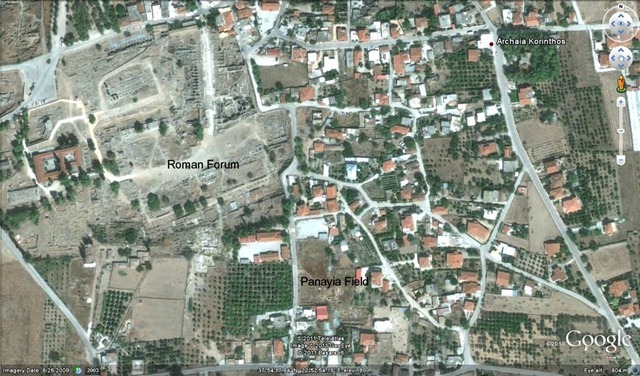 The area of Panayia Field is important generally because it highlights a residential part of the city in contrast with the public character of the forum. While most people who visit Corinth may have in mind the monumental Lechaion Road (depicted in the photo below) clearly demarcated by limestone pavements, columns, and adjacent buildings, most roads in the ancient city and countryside were simple unpaved roads with earthen surfaces. The road from the Panayia field as shown in photos in the article is wholly unimpressive in appearance. And yet, that is the primary importance of this article, for it provides a stratigraphic sequence of an ordinary road with a lifespan spanning some twelve centuries. Although the area was slowly changed from the 5th century, the road remained a defined usable path to the 12th century. Far from indicating the demise of the city in late antiquity, excavation of the road shows that the drain was even functional into the 9th or 10th century. Anyone who wants to become familiar with the complex nature of urban excavations in Corinth should read this article. The visitor to Corinth today may imagine he/she is seeing the remains of a city frozen in time but is actually looking at palimpsests of buildings of different times. This articles discusses the changing contexts of human activity in urban centers over centuries: manholes, cisterns, robbing and construction trenches, tortoise deposits, beddings, among many others. Real excavation is fraught with interpretive uncertainties reflected in the naming of buildings: “Long Building,” “Building with Wall Painting,” “Early Colony Building,” “Late Augustan Building”, etc..
Second, the article is important for its detailed catalogue of the water systems underlying the road. Excavations recorded some 31 lines of pipes of different phases from six centuries, all compressed to 1 meter below the road! The authors are able to create a typology for water pipes and offer a catalogue of the ceramic pipes, which serve to illustrate the nature of water and waste management. For another review of this article, check out my colleague Bill Caraher’s comments in The Rough Roads of Corinth at The New Archaeology of the Mediterranean World. *This is not an exhaustive list but it does hit on some of the major studies. Pfaff, C. A. 2007. “Geometric Graves in the Panayia Field at Corinth,” Hesperia 76, pp. 443–537. James, S. 2010. “The Hellenistic Pottery from the Panayia Field, Corinth: Studies in Chronology and Context” (diss. Univ. of Texas, Austin). Hellenistic pottery. Lepinski, S. 2008. “Roman Wall Paintings from Panayia Field, Corinth, Greece: A Contextual Study” (diss. Bryn Mawr College). Slane, K. W., and G. D. R. Sanders. 2005. “Corinth: Late Roman Horizons,” Hesperia 74, pp. 243–297. Sweetman, R., and G. D. R. Sanders. 2005. “A New Group of Mosaics from Corinth in Their Domestic Context and in the Context of the Colony,” in La mosaïque gréco-romaine IX. Actes du IXe Colloque international pour l’étude de la mosaïque antique et médiévale organisé à Rome, 5–10 novembre 2001 (CÉFR 352), ed. H. Morlier, Rome, pp. 359–369. Stirling, L. M. 2008. “Pagan Statuettes in Late Antique Corinth: Sculpture from the Panayia Domus,” Hesperia 77, pp. 89–161. Sanders, G.D.R., 2005. “Archaeological Evidence for Early Christianity and the End of the Hellenic Religion in Corinth,” in Urban Religion in Roman Corinth: Interdisciplinary Approaches (Harvard Theological Studies 53), ed. D. N. Schowalter and S. J. Friesen, Cambridge, Mass., pp. 419–442. Sanders, G.D.R. 2004. “Problems in Interpreting Rural and Urban Settlement in Southern Greece, a.d. 365–700,” in Landscapes of Change: Rural Evolutions in Late Antiquity and the Early Middle Ages, ed. N. Christie, Aldershot, pp. 163–194. Sanders, G.D.R. 1999. “A Late Roman Bath at Corinth: Excavations in the Panayia Field, 1995–1996,” Hesperia 68, pp. 441–480. Rohn, A. H., E. Barnes, and G. D. R. Sanders. 2009. “An Ottoman-Period Cemetery at Ancient Corinth,” Hesperia 78, pp. 501–615.